The Macedonian Muslims are Macedonians by origin and Muslim by faith. The Macedonians of muslim religion were Orthodox Macedonians, who have converted into the Islam in a period, that started in 16th and lasted until the second half of 19th century. The Macedonian Muslims are largely the descendants of Orthodox Christian from the region of Macedonia who converted to Islam during the centuries when the Ottoman Empire ruled the Balkans. However, this conversion from one into another religion was not massive, but rather individual and lasted for a long period of time. They are known as Torbeši and Gorani. History science says that there was no single reason for accepting the Islam, but rather many motives. The main motive is the need for protection of the population (especially the one in western Macedonia region) from the Albanian gangs which were intruding from Albania and raiding the region on daily basis. In fact, the only way out from this state of raids and plunders done by Albanian kačaks – mainly from Ljuma and Mat – who also killed people, was accepting the Islam, as in that case the Ottoman Empire would provide more efficient protection of the inhabitants. Breaking off with Christianity by unmarried girls by marrying Turkish beys and landlords had a significant impact on creating kin bonds with families of the Islamized girls; this led to softening of religious attitudes and change of confessions. Working abroad in Turkey, Middle East, and other regions with Muslim majority is another factor for Islamization of the Macedonians. Virtually, when people working abroad would return to their homes they were already Islamized and they would pass the Islam to their families. Accepting the Islam influenced lowering of taxes for those families, which also provided opportunities for higher social rank. The most of these, Macedonian-Muslims by faith still have Macedonian Orthodox relatives. There are cases all over western part of Macedonia, where can happen a Macedonian Muslim, to have a Macedonian Orthodox relative and vice-versa. They are most often called by the name Torbeši - "the bag carriers" (those that live in the Republic of Macedonia). However these people must be called, just as Macedonian (no matter they are Muslims by faith). Macedonian Muslims still keep the Macedonian-Orthodox tradition of cuisine, wedding as well as other everyday tradition and habits. But, they still celebrate Bajram, instead Easter. These people, Torbeši do not have very firm Macedonian national affiliations, nor a separate, Torbeši identity. However, the last Macedonian census of 2002 confirmed the deep split in the Torbeši community of the Republic of Macedonia but members of it declared themselves mainly as Macedonians, of Muslim faith, but also as Albanians, Turks, Bosniaks and simply Muslims. 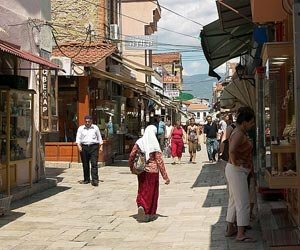 They usually live in western part of the Republic of Macedonia in Struga, Debar, Centar Zupa, Gostivar, Tetovo, as well as in Skopje and south-eastern of Skopje (Torbešija area) Studenicani and Zelenikovo. During the armed conflict in 2001, the Macedonian Muslims began Slavicizing their surnames, such as: Emini became Eminovski; Demiri - Demirovski, Bekiri - Bekirovski, Hasani - Hasanovski, etc. Gorani is the same group of people, Macedonian, but only with different name are also Gorani in Kosovo (Serbia). The name comes out from the Slavic word for mountain - gora, because they live in a region called Gora, which is, just south of Prizren, in the Sar mountains in the Serbian province of Kosovo and Metohija. Villages populated by them are: Backa, Brod, Dikance, Globocica, Gornja Rapca, Kruševo, Kukaljane, Ljestane, Ljubovište, Mlike, Orcusa, Radeša, Restelica, Veliki Krstec, Vranište, Zli Potok, Mali Krstec, Donja Rapca. In addition to speaking a local Torlak dialect locally known as Goranski or Gorani, most also speak Albanian. However, calls for a Greater Albania by some Albanians have had a negative effect on Gorani-Albanian relations. The 1980's saw the advent of a Gorani national revival, they officially broke away from the name of 'Muslims by nationality' (as dictated by the Yugoslav government to describe primarily the Slavic Muslims in Bosnia). Most began Slavicizing their surnames (i.e. Ahmeti became Ahmetović) which they claimed had been Albanizing during the Kosovo Communist Albanian rule in the 1970s and 1980s. As the Gorani resided in the southernmost tip of Serbia (and Kosovo) they prided themselves as being the sole guarantors of Serbia's southern flank. The Gora is covered with rough terrain, its name even means "The mountain" in Slavic and the name of its people 'The mountaineers'. The Gora is an underdeveloped region and for almost two centuries, its male inhabitants would go off to more distant regions in order to find work. Due to this, a true Gorani Diaspora has come to life with many living in parts of Inner Serbia (particularly the Eastern parts, Macedonia (particularly the Western parts), Italy and Turkey. The Gorani numbered some 16,000-strong, in the Gora administrative division, according to the 1991 census. This figure grew to over 20,000 by the start of the Kosovo War in 1999. The Gorani became targets of the Kosovo Liberation Army and the Kosovo Protection Force after the retreat of the Yugoslav Army and arrival of KFOR in June 1999. As a result, Gorani leaders estimate that fewer than 10,000 are left in Gora. The UN administration in Kosovo and Metohija, UNMIK, has redrawn internal boundaries in the province in such a way that a Gorani-majority county no longer exists. The Gora was combined with the neighboring Albanian-populated region of Opolje (some 20,000 strong) into a new subdivision which now has an Albanian majority.